Guyana Manganese Incorporated (GMI) plans to employ more than 500 Guyanese in the construction of its manganese operations in Matthew’s Ridge, a senior company official. Steven Ma, Assistant General Manager of Bosai’s Overseas Department said construction is set to begin in July and 550 locals from the region and across Guyana would be employed during that phase as well as during production. Currently GMI is employing 20 locals in the engineering design and survey phase. GMI is investing US$100M in the first phase of the operations. During the construction phase, the mine ore processing plant, washing plant, warehouses and factory will be established. The company is currently procuring equipment, Ma explained. 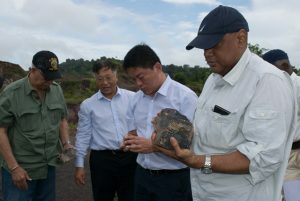 Minister of Natural Resources, Raphael Trotman, and Chinese Ambassador to Guyana, Cui Jianchun on Monday visited the Matthew’s Ridge, Region One mine site to assess progress that has been made since GMI purchased the area from Reunion Manganese Inc. (RMI) of Canada. GMI, a Bosai Mineral Group company, is currently on track to develop the mines, plant and factories to begin extracting the mineral by early 2019. Ma pointed out that the company is facing logistic challenges for moving the ore from the plant to sale. While road and port facilities were identified, GMI, Ma said, is currently mapping and surveying these to design the best solution going forward. Minister Trotman noted that the government is committed to improving the road in collaboration with the company, particularly as it relates to maintenance. He also committed to discussing the sharing of facilities with bauxite company Rusal, as GMI resolves the logistics challenge. The Minister stressed the importance of mining in Region One to GMI. “We’d like to see a resurgence in this region and so government is very keen on getting it started,” he was quoted as saying by government’s Department of Public Information. He also charged the company to honour its corporate social responsibility and singled out the community hospital for attention in this regard. “We expect you to be a good corporate citizen and to give back,” Minister Trotman said. Meanwhile, Region One Member of Parliament, Richard Allen, said the region in particular is looking forward to the resurgence of manganese mining. “This is a timely visit when not just Matthew’s Ridge or Matakai sub-region is looking forward for the establishment of the manganese company which brings relief and lot of employment,” he said. Chinese Ambassador Jianchun said he is proud of the example Bosai has set in Linden and charged GMI to have a similar integrated approach in Region One. “Through this project trys to push more to let the people benefit. I am concerned that we can create more jobs for the local community,” Ambassador Jianchun charged. He also encouraged the company to be good corporate citizens. GMI purchased four prospecting licences that covers an area of 45,729 acres, exploration results, mineral agreement, certain properties and infrastructure from RMI of Canada in November 2016. The total manganese resource in Matthew’s Ridge is some 26M tonnes. Ma said to produce the manganese concentrate, the company will have to mine some 2M tonnes per year which will see the life of the operation lasting some 12-13 years, if there are no other resources to be added.